(Mackinac Island, MI)- This year’s Chicago Mackinac Race was up to its usual tricks again, offering the fleet the dilemma of starting off with breezes in the NE to SE quadrants, with a hole forming in the middle of the rhumbline on late Saturday evening after the start, and then forcing teams into choices of staying west of rhumb and playing anticipated pressure arriving from the west or heading across the lake towards the classic eastern shore “dunes acceleration” of southerly breezes and playing the “point strategy” going up the Michigan coastline before rounding Pt Betsie halfway into the race. Then, the choice again was whether to hang outside and north of the Manitou Islands or stay the rhumbline course inside and south, the more direct route to Greys Reef before the 35nm sprint down the Straits of Mackinac to the finish line. No matter what fleet you were sailing in, it seemed everyone had slightly different variations on the three main choices on the menu from a strategic standpoint. What was self-evident was that all five one-design J/Fleets all had variations on those themes and no one could point to the “perfect” race. Nevertheless, 10 of the top 25 boats in the Mackinac Cup Division were J/Teams in a fleet of 135+ boats; J/111’s again took 3 of the top 6 overall! For the Level 35 Division, BAD DOG (Larry Taunt) and TOUCH OF GREY (Larry Schell) were virtually glued together the entire race, matching each other’s tactics all the way up to the finish line at Mackinac Island. Both stayed west of rhumb all the way up to Pt Betsie and both took the rhumbline track inside the Manitous to Greys Reef. In the end, BAD DOG took 2nd in class and edged out TOUCH OF GREY in third place. As one of the earlier classes to start, the J/105 class simply took off up the Illinois/ Wisconsin shoreline as one huge pack. Like most other boats in the area off Racine to Milwaukee, the big hole emerged over rhumbline around 11:00pm and their class rapidly evolved into two schools of thought— one group kept heading north along the Wisconsin shore while another pack took off on starboard tack west of rhumbline. It was the latter group that took 1st and 2nd in class and both of them also went inside the Manitous on the way to the major turning point at Greys Reef. Leading the fleet home was HERE’S JOHNNY (John Moore), followed by BUZZ (Mark Gurney) in 2nd, then PTERODACTYL (Mark Symonds) 3rd, GREEN FLASH (Jane Enterline) 4th and VYTIS (Gytis and Tomas Petkus) in 5th place. The fleet of nine J/109s followed a similar course of action as their J/105 colleagues. The leader was established between the 11pm “shutdown” and the new breeze that filled in by 3:00am from the SE around 175. The boats that could maintain headway in 2-5 kt winds dramatically lengthened, or newly established, their leads over the fleet at that time. As one of the top three boats, NORTHSTAR (Dave Gustman) made the most of the situation and established a jump on the fleet they never relinquished. Behind them the balance of the top five juggled positions all the way to the finish with MOMENTUS (Kevin Saedi, George & Robin Simkins) taking 2nd, followed by CALLISTO (Jim Murray) in 3rd, DRIVEN 2 (Jim Milliken) 4th and SLAPSHOT (Scott Sims) 5th. Having started quite a ways behind the J/109s and J/105s, the J/111 class roared up the lake in the building Easterly breeze under jibs and by late afternoon were already setting their mind-numbingly fast Code Zeros to continue to rapidly catch the fleets in front of them. By 11pm when the wind shutdown, the top three boats were IMPULSE (Miz, Dreher & Hatfield) in 1st, WIND CZAR (Rick Lehmann) in 2nd and NO SURPRISE (Dave Irish) in 3rd. For the next three hours, the boats all juggled positions with half the fleet gybing early in the new SE breeze and headed for the Michigan shoreline, another group continued to struggle north in hopes of more breeze. Emerging from the “mix-master” at midnight was NO SURPRISE in 1st with a pack of boat hot on their tail spread across just behind them. At sunrise, KASHMIR had leapt in 2nd followed by WIND CZAR in 3rd and IMPULSE dropping to 4th. For the next hours, the four boats played a game of “cat & mouse” along the eastern side of rhumbline along the Michigan shore. By Pt Betsie, IMPULSE had jumped back into 2nd followed by WIND CZAR in 3rd and KASHMIR in 4th. 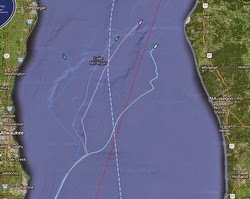 The standings jumbled again as a late-arriving pack of 4 boats from way out west of rhumbline headed by Martie Roesch’s VELOCITY stayed out and rounded the Manitous outside and to the north. That plus the fact that KASHMIR took one more fateful gybe into shore before Pt Betsie dropped them into 5th. Meanwhile, the battle between WIND CZAR and IMPULSE was finally settled when an enormous 35 degree header rolled in from 175 degrees at 15-17 kts and WIND CZAR jumped back into 2nd place. From there on end the “die was cast” for the top five, NO SURPRISE sailing an excellent race to win class and take 2nd overall in the Mackinac Cup Division. 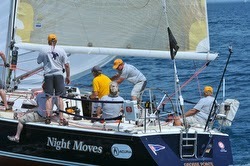 Second in class and 4th in fleet was WIND CZAR, followed by IMPULSE 3rd in class and 6th in fleet. The balance of the top five was VELOCITY 4th and KASHMIR 5th. In the big handicap divisions, the J/145 MAIN STREET sailed by Bill Schanen and family from Port Washington, Wisconsin finished 4th in Division 2. The Cup Division 3 fleet had two good performances, the J/130 EDGE skippered by Bob McManus took 4th and the J/133 SCIROCCO 3 sailed by Bob Klairmont took 5th. The J/122s battled it out this year in Division 4 and basically sailed a match race from start to finish. 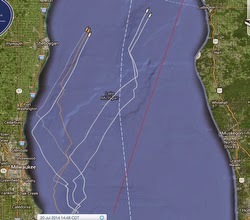 Both boats ended up east of rhumb after the 11pm to 3am black hole and proceeded to match each other off the Michigan dunes, but never taking advantage of any of the “point acceleration” strategies. In the end, Matt Songer’s EVVAI got the upper hand early and never let go, taking 5th in class and 21st in Mackinac Cup division overall. Mitch Padnos’s & Tracy Brand’s famous SUFFICIENT REASON (the 2013 Overall and Class Division winner) had a rougher go of it this year and settled for 8th in class. In the Double-Handed Division, the J/29 TFWB RELENTLESS sailed by George & Scott Petritz sailed well, finishing late afternoon on Monday to take 2nd overall in their division. J/125 TIMESHAVER Flies Dana Pt Offshore. Win A J/70 One-design Speedster! Top J/Sailors Led Etchells 22 Worlds! J/24 Kiel Week Ends With Tie-breaker! J/70s Germany & Europe Growing! J/111 STORMs Giraglia Rolex Race! FREIGHT DOG Tumbles to Dallas Honky Tonk Win! Hokey Smokes! Crazy 88s Win Chicago-Waukegan!